The traditional hackamore, known in classical terms as the Jaquima is a versatile tool that can be applied to any discipline and any breed of horse. First impressions are important, in order for your horse to accept and appreciate the subtlety of the hackamore, his first experience needs to follow carefully executed foundation work. The hackamore is made of three components: a mecate, bosal and hanger attached to the Bosal. The hanger can be anything from a simple strip of latigo to a full headstall. Unlike a bit, that transfers pressure signals only through the mouth of the horse, the hackamore communicates signals over a broader area of the face, chin and muzzle. Any horse in fact, can benefit from the hackamore. In this case, the horse we’re introducing to the hackamore is not a young colt but a twelve-year-old, Oldenburg warmblood mare. I bought her a few months ago and In her previous life, ‘Grace’ was a successful show jumper. She’s always been ridden in European tack, with direct contact on the bit and lots of support from her rider. My goal in using the hackamore with Grace is to re-introduce a soft feel. With the help of Professional trainer Stephanie Durand, we want to develop lightness, balance and hopefully encourage her to become softer. For Grace, the feel of the traditional hackamore will be different than the direct pressure of the snaffle bit she’s used too. With Stephanie’s help, we want Grace to eventually learn to carry herself on her own instead of relying on her rider for constant support. Offering her a different means of communication is a bit like starting out fresh all over again. 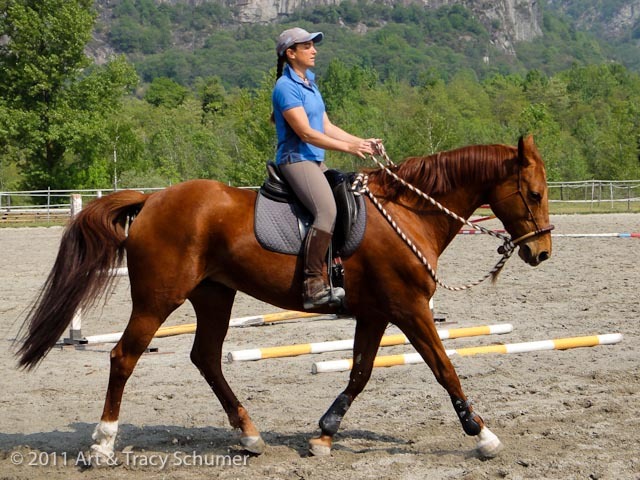 A person might think that once this mare had been trained as a show jumping horse, she would be unable to change disciplines later in life but in fact, horses change careers all the time. For example, I’ve seen thoroughbreds off the track that have made good cow horses; even going straight up in the spade bit. Grace is a kind mare but she’s no dead-head, just below her quiet surface you’ll find a high energy horse that’s very sensitive. She’s also big, tall and powerful owing to her German Warmblood breeding- nobody is going to push this mare around, best to ask politely! 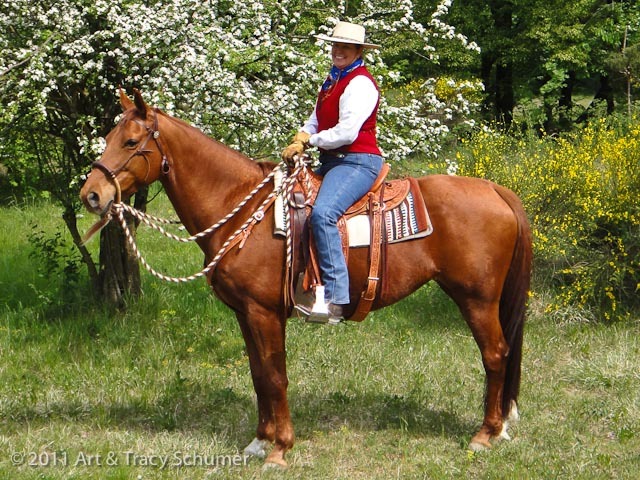 Stephanie acquired her hackamore skills through famed bridle horse trainer Mike Bridges. She’s also spent time in the US studying with Pat Parelli and is currently working through an advanced certification program with dressage master Philippe Karl. Dressage? Isn’t this about using a piece of Vaquero cowboy gear? What fascinates me most about horsemanship is what I see as a kind of pyramid shaped progression. I see the base of the pyramid as made up of all the different disciplines, every activity we do with horses at every skill level. As a person’s skill with horses advances, their line of progression starts climbing up the sides of the pyramid. The pyramid becomes more and more narrow as fewer and fewer people have the time and talent to move ahead. When a truly dedicated horseman finally gets near the top they realize that everyone around them has had the same goal all along; the differences that seemed to exist at the base have vanished. It’s here that they realize that we’re actually all the same. This is what every great horseman knows; what saddle we ride, the equipment we use, how we dress- none of this actually matters. I watch as Stephanie works with my big red mare on the ground. She’s moving the mare in tight circles, encouraging her to bend and to reach under herself as she steps through. Grace tends to be a bit more stiff and resistant on her right side so Stephanie has been working to help her gain better balance and more equal movement so both sides; right and left will work together. “When she was in her mother’s womb,” Stephanie explains, “She probably spent her time curled on her left side.” Horses, just like people, tend to be better coordinated on one side verses the other. Stephanie continues moving Grace from the ground in the rope halter until she’s satisfied that the mare is ready for the hackamore. We’d previously fit the bosal to the mare, choosing a 5/8" diameter bosal (19 millimeters) with a soft braided rawhide core, tapered latigo nose button and medium weighted heel knot. We’ve matched the bosal to a medium weighted main hair mecate that is 22 feet long. The mecate is also 5/8" in diameter. Stephanie has added one extra wrap when tying on the mecate so the fit will be closer to her jaw; this will eliminate any delay in the signal. It’s important to note that for safety, we’re working today in an enclosed arena. We slip the hackamore on and Grace accepts this new piece of gear without resistance. 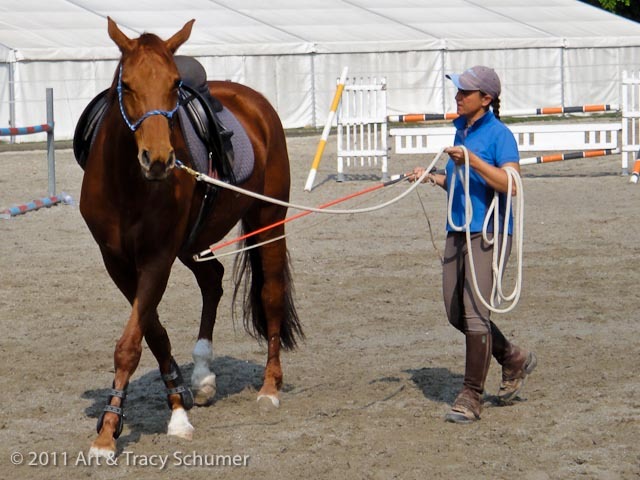 Then Stephanie repeats the same exercises she did with the rope halter- bending and flexing, allowing Grace to feel the action of the hackamore as if Stephanie were sitting on her. After a few minutes, Stephanie climbs aboard and they’re off. First at the walk, then after Grace began to soften at the walk, Stephanie moved her up into the trot and finally, after about an hour, a nice light canter around the arena. Grace has taken to the hackamore like a duck to water- it’s really fun to be a part of the process. We took our time, worked at the horse’s pace and this paid off in the end. Grace is now riding nicely in the hackamore after only four training sessions. I’m now riding her myself and we even had our first ride outside on a wooded public trail- Grace was terrific. 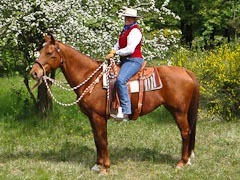 The traditional hackamore has it’s own special advantages and shouldn’t be limited to western riding alone. For any horseman who would like to go “bitless”, this unique piece of gear may be just the ticket.